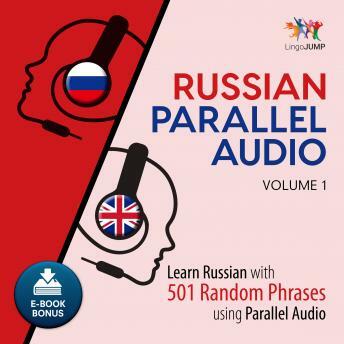 Listen to "Russian Parallel Audio - Learn Russian with 501 Random Phrases using Parallel Audio - Volume 1" on your iOS and Android device. We will have you speaking Russian in no time! Lingo Jump's parallel audio language learning system makes it easy to learn languages at your leisure. Whether you're relaxing or on the go, our simple, clear, and fun audio lessons help you learn through imitation of our speakers. Parallel audio is the key to Lingo Jump's language-learning methodology. Through repetition of clearly pronounced words and phrases at a tempo that's easy to follow, you'll not only find it easier to understand and speak Russian, you'll also improve your memory, boost your listening skills, and pick up the correct accent. Lingo Jump is ideal to get beginners speaking a Russian almost immediately. The parallel audio system also helps intermediate and advanced speakers achieve fluency in a new language. As you progress, the parallel audio system has you repeat phrases at their natural tempo, removing the slower versions. You can put your newly acquired listening and comprehension skills to the test in the final chapters, where you'll listen to the phrases without any parallel audio. This motivating feature helps you track your improvement, and gets you speaking Russian with confidence. We've specifically developed our language courses for audio learning, so you can complete other tasks while learning Russian. You can learn while you are running, working out, walking, driving, or even when you are doing chores. Our parallel audio learning system teaches you wherever you are, without requiring a reference manual.